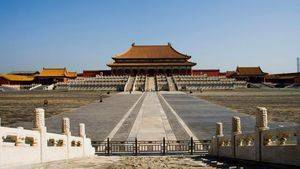 Its main feature is its floor area: The Forbidden City occupies a rectangle of 72 hectares, making it one of the largest palaces in the world. It is one of the oldest in China, and also one of the most visited. Whether in terms of layout, three-dimensional appearance or general appearance, this complex is truly an unmatched masterpiece in the world. 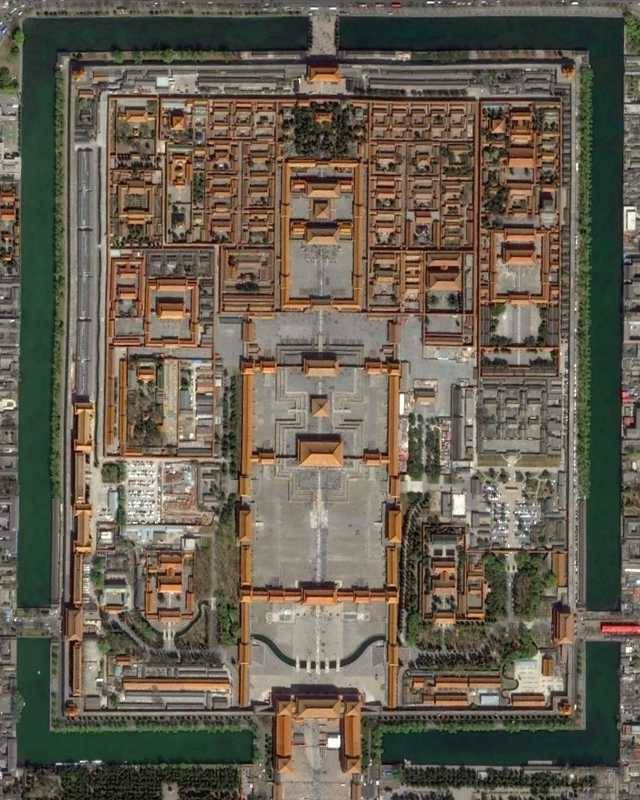 The main characteristic of the forbidden city, of rectangular form, is to be symmetrical. She shares this curiosity with the Taj MahalTaj Mahal in India, which is also a complex of several buildings with a foolproof symmetry. A central axis crosses the whole palace, which is the one crossing the city of Beijing in its center. 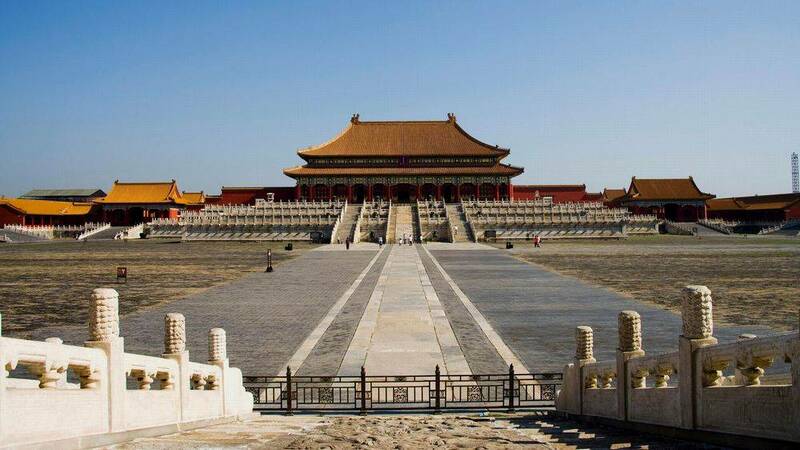 The Forbidden City is divided into two parts, North and South. The southern part served as a working area of ​​the emperor and the north of dwelling place. The main structures are arranged along the central axis, and the buildings on both sides of the axis are symmetrical. The main structures of the Southern Zone are the Taihedian (the pavilion of the supreme harmony), the Zhonghedian (the pavilion of the Harmony of the middle) and the Baohedian (the pavilion of the Harmony Preserved). These three main pavilions are built on an eight meter high platform covering a total area of ​​about 85,000 square meters. The Taihedian is the largest and most imposing hall in the city. 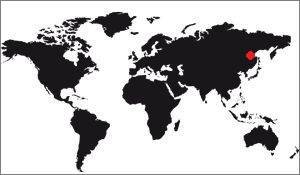 It is 60.1 meters wide, 33.33 meters deep and 35.05 meters high. It was here that the most important ceremonies of feudal dynasties took place, such as the Emperor's enthronement, marriage, and titles. It was also used to launch the departure of distant expeditions. On each of these occasions thousands of people chanted "long life, long life, and long, long life" to his majesty, accompanied by hundreds of musical instruments, bells, drums, which sounded in unison . Behind the Taihedian is the Zhonghedian, where the Emperor used to rest before receiving high officials or before attending grand ceremonies. The most northerly structure is the Baohedian, in which the emperor held banquets and interviewed the candidates selected for the imperial examinations. The entire complex is closely monitored by two lines of defense. The first is the ditch, which measures 52 meters wide and 6 deep, it protects the city wall. The other is this wall, 3400 meters long for 10 meters high and 8.62 meters wide at the base. It has four gates: The South Gate (Wumen), the North Gate (Shenwumen), the East Gate (Donghuamen) and the Western Gate (Xihuamen). At the four corners of the wall stands four towers, each with a three-layer eaves and 72 edges, which make it a marvel of framework. They are masterpieces of ancient architectural art. Some of the halls of the Palace Museum are transformed into an exhibition hall: Historical Arts, Jewelry Room, Watches and Clocks Room, Paintings Gallery, Temple of Pottery, Toys Gallery, etc. The museum has a collection of 1,052,653 pieces (exactly) of ancient art treasures, representing one-sixth of China's total cultural relics. It is the museum with the richest collections of China, and also a world-renowned museum concerning cultural art. See also: Architecture of the Forbidden City. Of course with such a profusion of courses the forbidden city has a very large number of pavilions. Whether called pavilions, halls, palaces or temples, it is always a unique building housing one or more rooms whose role is perfectly defined under one roof. 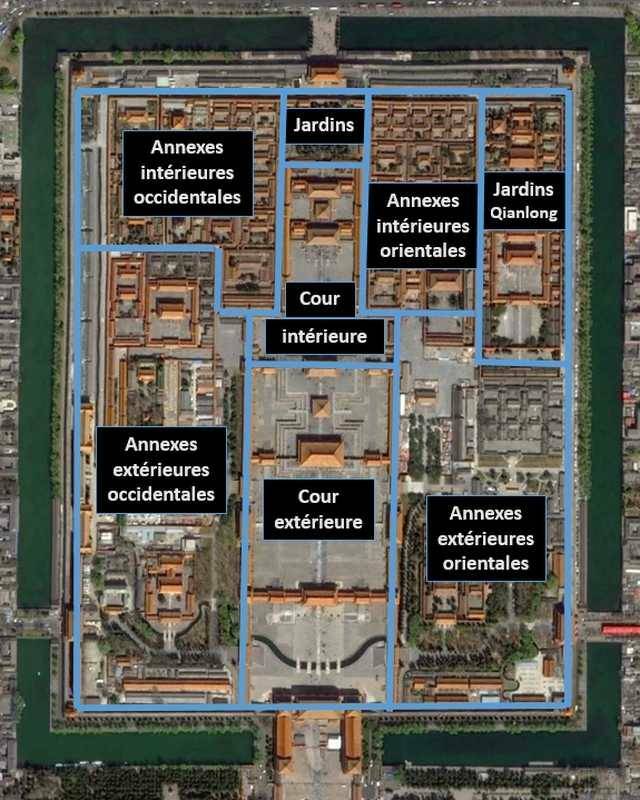 It seems that there are more than 8000 rooms in the forbidden city, spread out in many pavilions. The best-known pavilion is that of preserved harmony, the one in which the Emperor exercised his power. Political center of Chinese life, it was the place where all the public decisions were taken. The Meridian gate was not only the main gate of the palace, but also a defensive building of importance. The Empress lived in the Palace of eternal longevity. These three very different examples mark the variety that can be found on the spot for the assignment of a pavilion to a given task, but it is interesting to note that this palace has not ceased to be modified, some pavilions changing of attribution, others being constructed, etc. See the complete list and the description of all the pavilions. One of the characteristics of the Chinese imperial palace is the uniformity of its architecture. Much more respected than symmetry, the forbidden city has an obvious coherence in the architecture of pavilions (as well as palaces, halls, kiosks, belvederees, etc.). They are painted red (in fact, is supposed to be "purple", see the symbolism of the forbidden city on this subject), that they have yellow or green tiles, at least for the most important buildings, and that the buildings are all rectangular with an approximate proportion standardized among all. There are, of course, some exceptions, such as circular looking belvedere, but they are rare. The decoration is also fairly uniform from one pavilion to another. 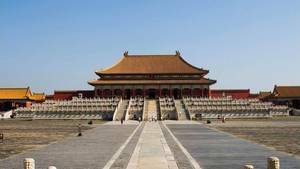 Learn more about the architecture of the Forbidden City. Central to Chinese politics for hundreds of years, the Forbidden City was also a symbol of imperial power. It was therefore necessary to protect the palace in all possible ways, vis-a-vis human beings but also with respect to the Gods. The palace was thus filled with various and varied symbols to promote the perenniality of the site. For example, the roofs were often provided with reproductions of small dragons intended to evade evil spirits. A great classic that can be found in many civilizations. Learn more about the symbols of the Forbidden City.